Last Wednesday, Andrew McGreen posted a link titled “Donovan Talks, U-20s, and Brek Shea” and 57:07 on the American Outlaws: Des Moines facebook group. I have much time for soccer podcasts, but I do like the Best Soccer Show, and I had three minutes, so…. The clip from 57:07 starts out with someone who’s written in to ask why hasn’t Des Moines been considered for NASL or USL-1 expansion? My heart just about burst. Eleven years ago, I worked for the Stadium Foundation as the Event Coordinator. We were working to build what, at the time, would have been the 4th soccer-specific stadium in the US, which would have allowed Menace Soccer to move from the PDL to what was then the A-League, and is now USL-Pro. It was a great plan, that would have given Des Moines the soccer street cred it deserved. At the time, we were (and still are) out-drawing teams in higher leagues, we had the highest participation per-capita in US youth soccer, and we have a sports fan base that supports semi-pro level sporting events well. It killed me when the Urbandale City Council voted down the proposal to build the stadium in their land-locked suburb. I thought it was incredibly short-sighted, and a decade later, I could write an entire post about why it was the wrong decision for Urbandale and central Iowa soccer. Suffice it to say that I have always believed that Des Moines is a “diamond in the rough, with a beyond competent front office”, and belongs in a higher league than PDL. While I recovered from my mind-explosion that someone read my mind and then wrote to Best Soccer Show about it, I was hurtled back down to Earth by Jared and Jason’s response. Here’s a clue: when someone says “No offense to Des Moines” it’s probably really offensive to Des Moines. I had to roll my eyes at “the thing about Des Moines is that it’s Des Moines.” Oh guys….really? Maybe 20 years ago, when I moved here from the New York metro, Des Moines would have skulked off, apologizing for how uncool it is. Not anymore. Now we’re consistently ranked not just best place to raise your kids, but best place to start a business, be a young professional, and the list goes on. Plus, we have Raygun, the greatest store in the Universe, that is making a fortune mocking the fact that you don’t know the difference between Idaho and Iowa (here’s a hint, we’re no where near Cascadia). I don’t buy the argument that we’re “so far off the map from a pro-sports perspective.” We’re not asking for an MLS team (yet) and we actively support our Iowa Cubs and Iowa Barnstormers, as well as turn out in droves for college athletics of all kinds. We have Drake Soccer and Iowa State women nearby, and you’ve already praised our turn out for Des Moines Menace. Your suggestion to form a supporters group just shows how little you know about Iowa. We founded the 38th chapter of American Outlaws in 2010, and we travel strong to US soccer games. You know that big flag in the supporters section? That’s the Midwest Mama, and AO DSM owns it and brings it everywhere. 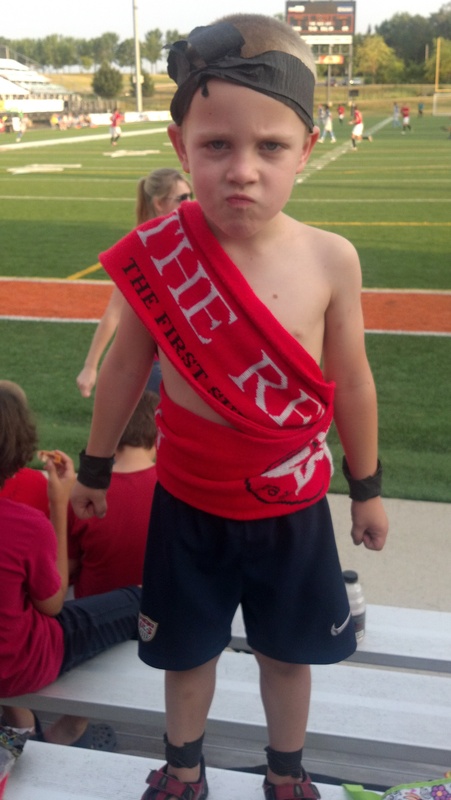 Back at home, the Red Army has supported the Menace for years, not just with tailgates, but we roast marshmallows after games, just because we’re Iowa Nice. And a message to Kyle Krause, Des Moines Menace owner, I keep telling you it’s time to restart the Stadium Foundation project….I’m waiting for your call.) Des Moines’ time has come, and it’s only a matter of time until the rest of the soccer world figures it out.